Attending Show Champion’s live broadcast was definitely one of the highlights of the Surfing The Korean Wave trip. It was also the most anticipated schedule amongst our packed and crazy itinerary. Even though this wasn’t my first time attending a live show in Korea, the excitement and adrenaline were undeniably still there. Reaching the venue at 4.30PM, it was not surprising to see the long queues that snake across the open area in front of the studio. From previous experiences, fans actually reach the venue early by taking the first subway or bus and for the more popular groups, fans usually need to come the night before to write their names. Different fanclubs have different ways of organizing their fans, so it will be good if you can head to the fancafe of the artiste you are supporting to check the music shows they are appearing on and the related criteria that will gain you priority. As the live broadcast of Show Champion starts at 6PM, we were being let into the venue at around half an hour before the show starts. Since we were the first group to head in (much thanks to Korea Tourism Organization), I was standing in the first row! Yes, you heard it right, the first row of Show Champion’s live broadcast. It was liken to standing in the first row of a mosh pit for a concert thus the view I got that evening was really awesome! Live Performances on Show Champion! The line-up for the 7th August Show Champion episode included f(x), EXO, Ailee, Brown Eyed Girls, A-JAX, MYNAME, VIXX, 24K, Outsider, M.I.B, BESTie, WASSUP, TAHITI, AOA and Sunny Days. Like many would have already known, attending a live broadcast is liken to attending a mini concert, with at least 10 groups of artistes performing to their latest release. And the best part of it all is the fact that these live broadcasts are free. Nope, you do not need to pay anything at all to gain entry, just probably your time since queueing up usually takes up half a day or sometimes even more. For music shows, artistes either get to perform their song live or they get to pre-record their performance earlier in the day. This is to ensure the smooth flow and transition of the different acts during the live broadcast. As such, what one gets to experience as part of a live broadcast is definitely different as compared to viewing the music show from the comfort of their homes. The best part of artistes having their performances pre-recorded is the outflow of fan service during the live broadcast since the pre-recorded versions will be shown instead. Artistes are also more responsive to fans if their performance was pre-recorded and their interactions with fans are usually more generous. Having not taken any special notice of 24K, MYNAME and A-JAX before, these groups did leave an impression with their performances – 24K’s U R So Cute being all chirpy and cheerful, capturing hearts with their endearing smiles, MYNAME’s Baby I’m Sorry having a really catchy tune accompanied by forceful dance steps and A-JAX’s Insane with an impressive choreography and repetitive lyrics which you’ll never forget upon hearing the song once. VIXX’s G.R.8.U performance left me a pretty deep impression too. In contrast to their previous releases On and On and Hyde, G.R.8.U takes on a really different feel, totally suited as a summer track, complete with smiles and cute dance steps. Having witness an impressive live performance, it makes me want to see their other stages live too. VIXX is definitely one group that has the calibre to make it big. A tinge of western cowboy feel could be felt from Brown Eyed Girls’ Kill Bill stage and the performance was not a let down at all. All four members stood out in their own ways and it was really hard to keep my eyes off them because they look really mesmerizing with their aloof expressions befitting the image of their title track. Outsider stood out amongst the other groups performing, with his latest release, Bye U. The speed in which he raps was definitely jaw-dropping and his chemistry with Kangnam of M.I.B was something really refreshing. The song is also really catchy, resulting in quite a significant number of people in the recording studio grooving to the beat. To be honest, I am not exactly a fan of EXO. However, I have to admit that they do have a strong stage presence. It was as though the stage was their playground as the boys utilised the stage to a T. Granted that they have 12 members, but the charisma oozing out from every individual member was something that was no doubt memorable. Growl was also playing in every other shop in Korea, making it the ‘theme song’ of our trip. My favourite performance that evening had got to be Ailee’s U&I! That was my first time witnessing her prowess live and all I can say is that her vocals is simply amazing. She literally wow-ed the crowd present in the studio and won the hearts of many who probably had no idea who she was prior to the recording. A thumbs up performance that everyone should witness live. Witnessing the encore stage during a live broadcast was something really interesting too. f(x) was the winner for that episode (with Rum Pum Pum Pum) and during the encore stage, it was really endearing to notice the interactions between f(x) and EXO – how EXO stayed on stage to cheer for their sunbaes as hugs and words of congratulations were being exchanged. And bonus cookie points to Amber because she walked down the stage and interacted with the audience while the other three members (Luna was not around) stayed on stage. Amber also started to be really random and started picking up the confetti-like streamers and giving them to random fans. All in all, this Show Champion experience was no doubt memorable. Once again, a big thank you to Korea Tourism Organization for letting us experience a live broadcast (with a first-class view) as part of our Surfing The Korean Wave Tour. ← [KTO] (x)clusive goes Surfing The Korean Wave! NYPCO K-POP CONCERT: K-Attack II! 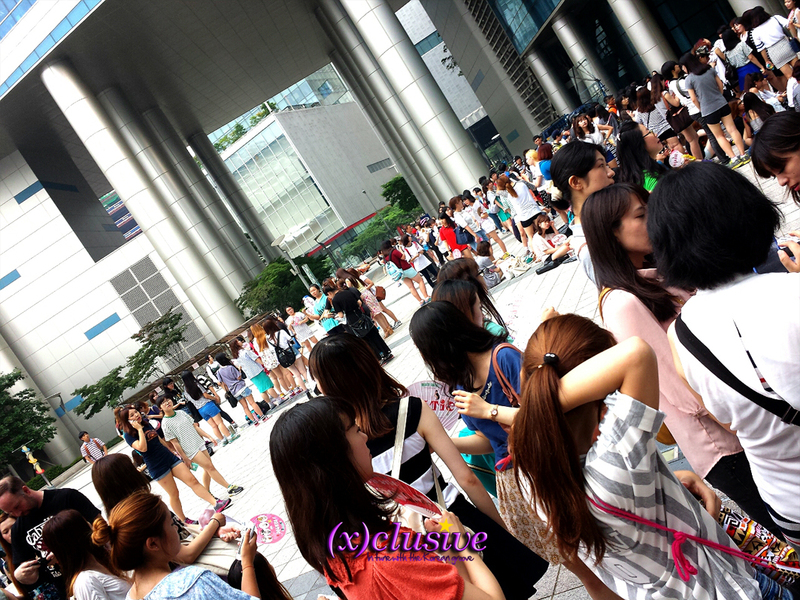 wow front row, not to mention that you dont have to queue too, definitely the great management of kto. but omg i didnt even realise BEG made a comeback!? so awesome yet diluted with EXO these days. Hello my loved one! I wish to say that this article is awesome, great written and come with approximately all important infos.